Since the end of last season, especially after the derby, the rumors about the end of Eduardo as goalkeeper of Genoa went on and on. Since Eduardo was rent to Benfica we had to wait for our new goalkeeper. Mr. Malesani wanted Emiliano Viviano his goalkeeper with Bologna last season and the substitute of Buffon in the Italian National team. Unfortunately last weekend Viviano was injured very badly (recovering-time around 5 months) which meant that Genoa had to look for another goalkeeper. Today Mr. Preziosi gave us a new goalkeeper: the very experienced 31 years old French goalkeeper of Fiorentina: Sebastien Frey. 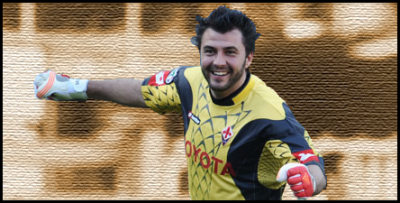 About this goalkeeper nobody has any doubts and he played for years with our central defender Dario Dainelli. After all the friendly matches in the weekend of 28th August Serie A starts with Napoli-Genoa, another match of friendship! In the next round in the weekend of 11th September Genoa plays at home against Atalanta Bergamo, the team that promoted from Serie B. On the 6th November Genoa plays at home against Inter and 4th December Milan has to come to Marassi. The last playround of the season is on 13th May with Genoa-Palermo. Today our Genoano of the year 2007-2008 Omar Milanetto left Genoa to the other team of President Preziosi: Lugano (Switzerland). After the goal in the last seconds of the derby by Mauro Boselli last 8th May several Genoa-players like Rossi, Criscito and Milanetto (see foto) went to Gradinata Nord to blame them for the song: “Il derby non si regala” (the derby is not a present). 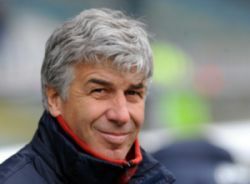 The fans thought that Genoa and Sampdoria made a deal to draw the derby, which should give an important point to Sampdoria in their struggle to stay in Serie A. Genoa-fans only had one wish: Sampdoria had to relegate to Serie B, so Genoa more than ever had to win the derby. After the goal of Boselli at 96’11” Milanetto should have screamed “Bastardi” (Basterds) to the fans in Gradinata Nord, who were furious. A few days after the derby Milanetto made excuses to the fans, but some of them did not accept this. For these fans Milanetto has made an unforgettable mistake and he has to leave the club. Today these fans got what they wanted: Omar Milanetto ends his career after 5 great season in Liguria with Lugano FC in the Serie B of Switzerland. 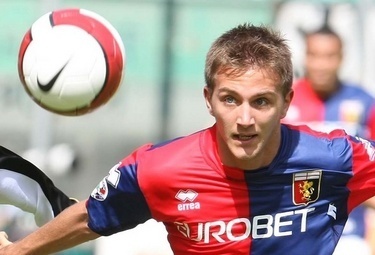 Tonight Omar Milanetto played his last 30 minutes with Genoa in Austria in the friendly match against Stubaital. The score at halftime was 2-0 (Kucka and Pratto) and with double scores of Ribas and Birsa in the 2nd half the match ended in a 6-0 victory of Genoa that played in the offensive 4-3-3 system. Goalkeepers: Lupatelli Cristiano (1978, Bologna Fc), Scarpi Alessio (1973, Genoa), Zima Lukas (1994, Sk Slavia Praga). Defenders: Antonelli Luca (1987, Genoa), Dainelli Dario (1979, Genoa), Granqvist Andreas (1985, Fc Groningen), Kaladze Kakhaber (1978, Genoa), Krajnc Luka (1994, Maribor), Mesto Giandomenico (1982, Genoa), Moretti Emiliano (1981, Genoa). Midfielders: Birsa Valter (1986, Aj Auxerre), Constant Kevin (1987, Ac Chievo Verona),Jorquera Cristobal Andres (1988, Csd Colo Colo), Kucka Juraj (1987, Genoa), Merkel Alexander (1982, Ac Milan), Milanetto Omar (1975, Genoa), Rossi Marco (1978, Genoa), Seymour Felipe (1987, Club Universidad de Chile), Veloso Miguel (1986, Genoa). Strikers: Acquafresca Robert (1987, Cagliari Calcio), Hallenius Linus (1989, Fc Lugano),Palacio Rodrigo (1982, Genoa), Pratto Lucas (1988, Cd Universidad Catolica), Ribas Sebastiàn (1988, Dijon Fco), Rudolf Gergely (1985, As Bari), Zè Eduardo Josè (1987, Santos Fc). Besides these 15 new players Genoa also bought Andes Escobar (Deportivo Cali, Colombia) but he now plays the World-Cup for players till 20 years. This week also Ajax-player Evander Sno was in Genova to sign a contract with our team, but he did not pass the medial tests because of his hart-problems. The following 14 players left us this summer: Eduardo (Benfica), Perin (Padova), Chico (probably Betis Sevilla), Criscito (Zenit St. Petersburg), Konko (Lazio), Rafinha (Bayern Munich), Boakye (Sassuolo), Boselli (Wigan), Destro (Siena), Floro Flores (Udinese), Jankovic (not known yet), Jelenic (Padova), Paloschi (Milan) and Rodriguez (Bologna).